that will be guaranteed to please my guests. I find the Jello Cooked Pudding mix works just fine. Reserve about 1/2 cup crumbs and press remaining crumbs into 9 or 10 inch pie plate. In a large bowl or glass 8 cup measure, stir pudding mix with milk, blending well with whisk. Microwave a minute at a time, stirring well each time until mixture begins to thicken and bubble. Add butter and vanilla, stirring well. Let it cool, stirring every few minutes while you prepare the bananas. Cut 2 or 3 large bananas into 1/2 inch slices and arrange on the bottom and around the sides of the graham crust. Pour warm custard filling over bananas and refrigerate until filling is completely cold. Whip one pint of Whipping cream icing sugar and vanilla. Spread over custard and sprinkle with reserved crumbs. Refrigerate until serving. I used to drop in on my Mom for coffee and there was always something good to eat in her kitchen or freezer. This recipe was one of her favorites and it is one of mine too. I make them in her two small old style bread pans. This loaf freezes well up to 3 months. Stir first 3 ingredients together in a glass bowl and pour boiling water over it. Stir well and let stand for 10 minutes. Add the softened date mixture. Stir together until all the flour is incorporated. Divide mixture into 2 greased loaf pans. Bake for 1 hour at 300 until tooth pick inserted in centre of loaf comes out clean. Leave in pans for 5 minutes and turn out onto cooling rack. 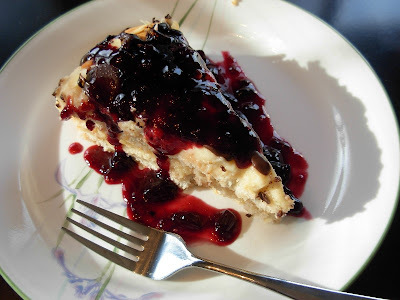 Knock-off Lovella's Genoa Cake - Gluten-free ! Lovella's Cake of Genoa looked so delicious I couldn't resist making a gluten-free copy-cat cake. 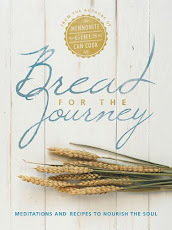 I made it for our bible study group this week... there was seven of us....and the cake disappeared quickly with complements and second helpings and requests for the recipe! Beat eggs and sugar until thick and creamy, add salt and vanilla. Mix all dry ingredients together well....... and then add to egg mixture , beating until smooth. Bake at 350' for about 40 minutes and cool in pan. Combine the sugar and cornstarch and Oeker's Vanilla sugar, add yokes (or eggs) and beat until fluffy . Cook until thickened.... remove from heat ..place plastic wrap directly on custard and let cool to room temperature.. Be patient ! Then mix in soft butter until perfectly smooth and place in fridge until firmed to spreading consistency . Put Butter Cream filling between the layers and then cover top and sides as well. Vic liked his piece of cake served with homemade berry sauce. This recipe is from the Best of bridge cookbook. They serve it over rice, but I usually serve it over Chinese noodles. They also toss in 1 1/2 cups of cashews just before serving. The fresh ginger and sesame oil are a must in this recipe. Serves 6. Combine sauce ingredients and set aside. Combine cornstarch, sugar and salt. Add chicken and toss. Heat frying pan or wok to high and add oil. When oil if hot (not smoking) add chicken, ginger, garlic and onion. stir until chicken is opaque (about 1 minute). Add peppers and carrots. Stir 2-3 minutes. Add snow peas and sauce. Cook until sauce comes to a boil. Serve over hot rice or noodle. Sprinkle with toasted sesame seeds. (if you want to add the cashews toss in just before serving. Thaw filets according to package instructions. Preheat oven to 350. Lay fillets on a lightly greased baking sheet. Combine tomatoes, onion, garlic, vinegar, lemon peel, oregano, salt, pepper and sugar in a large bowl. Spoon tomatoe misture evenly over fillers and sprinkle with cheese. Bake for about 5 minutes, or until fillets flake easily with a fork. Alternate lazy version and that is what the picture is. 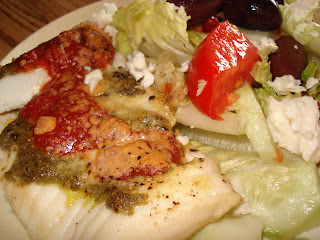 Top the fish fillet with pesto. Top with left over pasta sauce and a sprinkle of parmessan. Either way it is tasty, low in fat and healthy. Recipe source from the back of Highliner Frozen Tilapia fillets package. My son isn't a big fan of carrots, but he LOVES these. I use the sauce on other veggies too and it is something that gives just plain veggies a bit of punch to them. 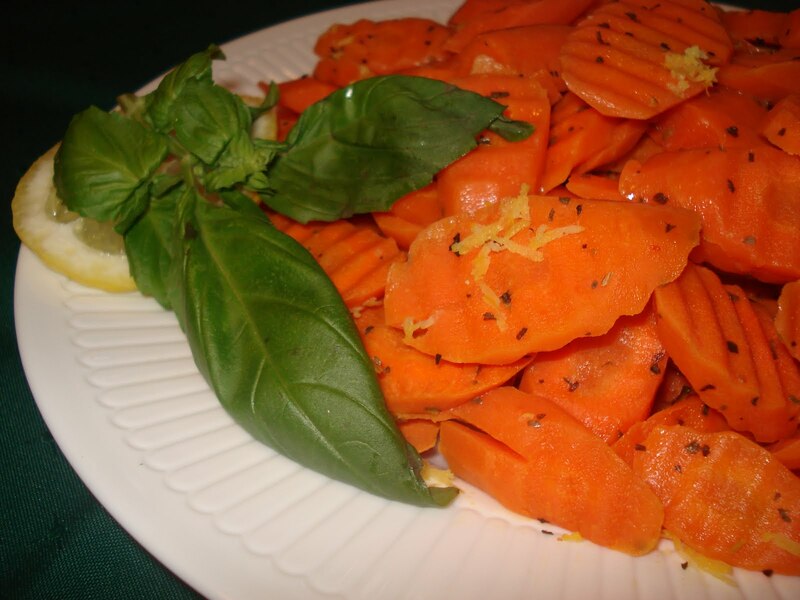 Steam carrots or green beans until tender crisp. Melt butter, stir in other ingredients and toss with the carrots. Enough for 4 servings, or 2 teenage boys. We're on somewhat of a waffle kick over here lately. I just discovered not so long ago that making french toast on the waffle iron is quite a simple thing and so delicious! So we've been trying it every which way, and today it was cinnamon raisin french toasted waffles. Preheat waffle maker and spray surface with non-stick cooking spray. In large bowl, whisk eggs until frothy, then add remaining ingredients and whisk until well mixed (lump free). Dip 1 slice of bread into mixture and turn to cover both sides. Place in waffle maker and cook until golden brown. Repeat with remaining slices. Dust with icing sugar and serve with warm maple syrup. It's a quick and delicious brunch! That's my recipe, but feel free to use your favorite french toast dipping batter and give it a try. If you prefer plain french toast with srawberries and whipped cream, check out the instructions over at My Front Porch. And here is another fun idea for your waffle iron...why not try your favorite loaf or muffin batter baked on your waffle iron? The possibilities are endless and I can't vouch for them all! 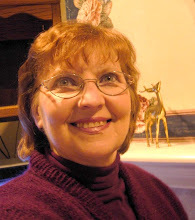 But, I did try pumpkin spice muffin waffles yesterday and had them for an afternoon tea party with the grands. They were ready in minutes and we enjoyed them hot off the press, smothered in butter, and they were quite yummy. So dust off your waffle iron and get creative! I have been making this dish since I was 15 or 16. It was one of the first dinners I had at Terry's house when we started dating . I asked his mom for the recipe and brought it home and made it. I still make this steak dish when comfort food is needed for ourselves or for others. 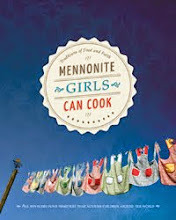 At some point I came across the cookbook that she used. Pound the flour into the steak or if it is already very thinly sliced sprinkle it on either side. Heat the oil in a heavy saucepan and brown the steak on medium high heat. Remove the steak and set aside. Brown the vegetables and add the remaining ingredients. Stir well and add the steak. Cook in the oven at 325 for 3 hours. Slower and longer makes it more tender. You can also put it in the crock pot on low for 6 - 8 hours. Hint: Double the sauce ingredients for plenty of sauce over mashed potatoes. I got the idea for these pancakes from a local pancake restaurant, but after more than one serving of pancakes that were undercooked, I decided to try making them myself. 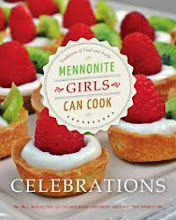 I use the German Pancake (crepe) recipe from the Mennonite Cookbook. Quarter and slice apples, as thin as you can. Beat eggs, then add milk salt and flour, beating until smooth. Heat (med size) non stick pan and lightly grease with butter for first pancake and then every other, if needed. Batter should not be too thick, but still coat pan nicely - add a little more milk, if needed. Pour a small ladle full of batter into pan while lifting the pan and tilting it in a circular motion, until the pan is covered with batter. 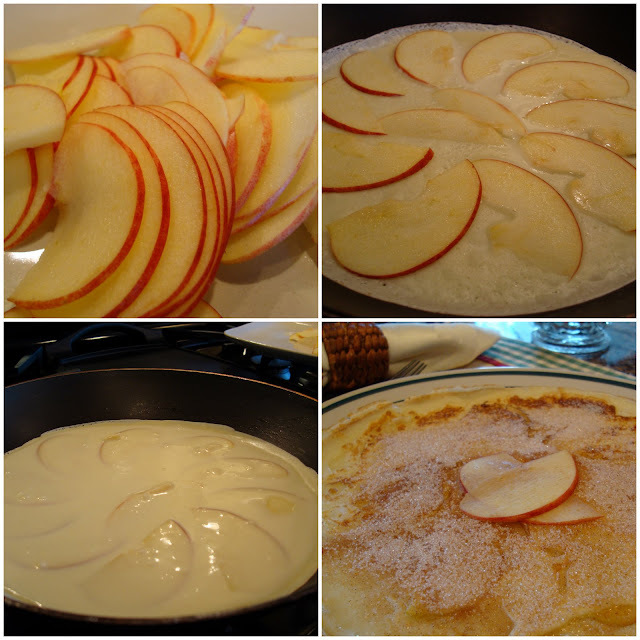 Spread with thinly sliced apple slices and cover with another layer of the batter. tilting pan in a revolving motion. Cook at med or just below med heat until batter looks dry on top and edges lift easily with plastic lifter. Flip carefully, but quickly. This recipe makes about ten 8-inch pancakes. I had some leftover Schmoo sauce from Charlotte’s Schmoo Torte I had made earlier and drizzled some of that on the pancakes. I won’t tell you haw many I had! 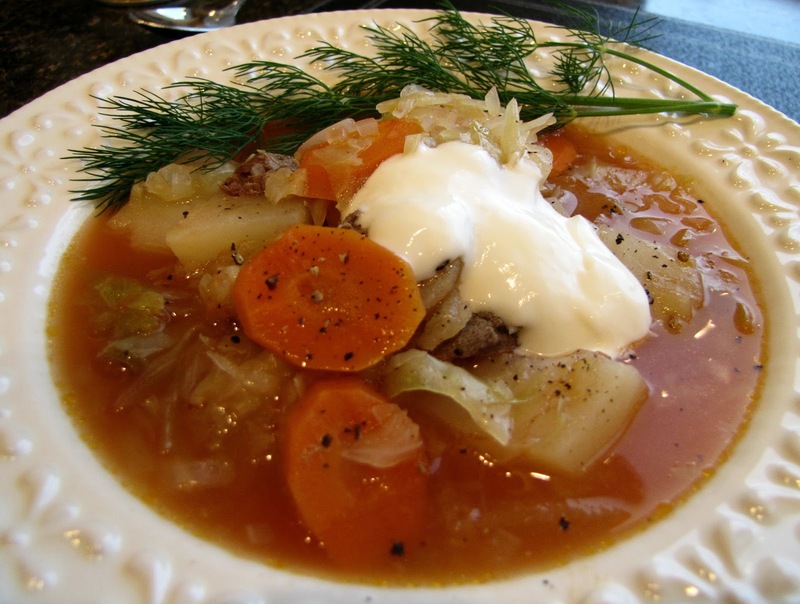 The Ukrainians made borsch, and the Mennonites of the Ukraine borrowed the soup but substituted cabbage as the main ingredient rather than beets, and called it Borscht. Cover soup bones with water and simmer until meat is tender (several hours). Remove the bone and shred the beef. Add more water to make 8-10 cups of stock before adding the vegetables. Add vegetables and seasonings (put chili peppers and dill into a spice cup or cheesecloth), and cook until vegetables are tender. Add tomato soup, diced tomatoes, and shredded beef...and bring to a boil. Add a wee bit more of this or less of that, and if you like it fiery hot, add more red chili peppers. 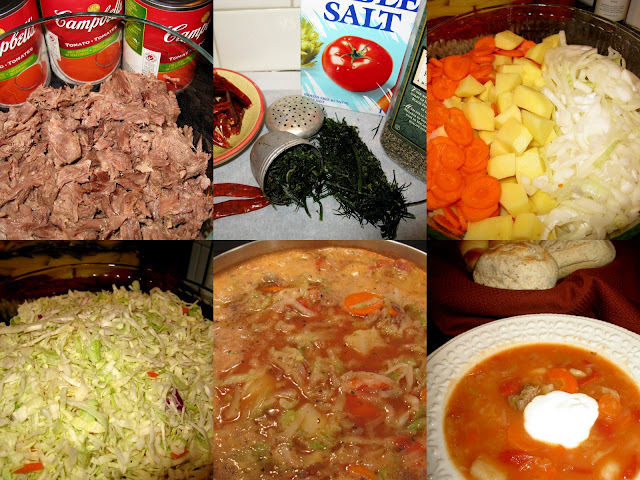 I often cook up a large pot, leave the spice cup in the soup and refrigerate it for a week of quick lunches. As the week progresses, our bowl of soup gets zippier! Fresh dill is the best but can also be harvested in season and frozen in ziplock bags to be used in soup. Today was a comfort food kind of day and this dish tops my list of comfort foods. and it really doesn't take much longer to make from scratch. cheddar cheese (old/sharp is best) coarsely grated. (I make my white sauce in the microwave but it can also be made on the stove. Melt butter in 8 cup microwavable bowl or medium saucepan. Stir in flour with a wire whisk until smooth. Very gradually add milk, stirring smooth with each addition. Microwave for 1 minute at a time, stirring well each time until sauce bubbles or cook over medium heat, stirring constantly. In buttered casserole dish, place a layer of cooked macaroni. Pour 1/2 of white sauce over to cover. Repeat layers ending with cheese. Bake at 350 degrees for about 30 minutes or until it bubbles at the edges. I served this cake at my husband's 60th birthday party this weekend and had so many requests for the recipe that I said I'd post it here. I got the recipe from my good friend Betti. The secret to the incredible taste is the caramel sauce poured over the warm cake and the Skor bar garnish of course. Read the recipe over before preparing. 2 or 3 Skor Chocolate Bars or another crunchy brittle style chocolate bar. Melt margarine, add cocoa and hot water and bring to a boil. Measure sugar,baking soda, salt, vanilla and flour into a large mixing bowl. Add beaten eggs and sour cream and mix well. Spread in jelly roll pan. Add brown sugar, corn syrup and sweetened condensed milk. Bring to a boil and cook for 2 minutes. Watch carefully as it scorches easily. Remove cake from oven, let sit for 5 minutes. Poke holes in cake with meat fork about 1/2-1 inch apart. Spoon some of the caramel sauce over the cake, filling all the holes. Let remaining sauce cool to spreading consistency. Then spread remainder of sauce over cake. Crumble Skor bars and sprinkle over cream layer. This cake works well to make ahead. Freeze the cake after spreading the caramel mixture. Leave in Freezer until an hour or so before serving time. Whip cream, spread over caramel and sprinkle the Skor bar crumbles just before serving. 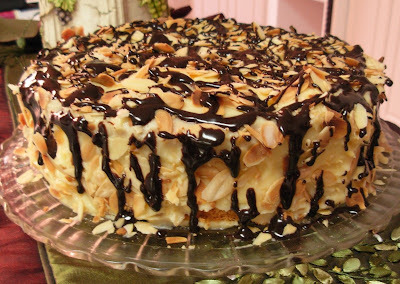 This cake can be served simply or made into a special cake with garnishes. Prepare two 8 inch pans or one 5 inch springform pan by greasing and lining with parchment paper. Beat the eggs until light and fluffy. Gradually add the sugar, salt and vanilla. Beat until thick and lemon colored. Gently fold in the flour, 2 tablespoons at a time. Bake for about 25 - 30 minutes. Test with a toothpick. The recipe calls for Butter Cream between all the layers and then icing the outside the same. I whipped heavy cream, added a bit of sugar and used some Whip it to stabilize the cream and spread the whipped cream between the layers. Combine the sugar and the cornstarch in a large microwave safe bowl. Add the eggs or egg yolks. Beat until fluffy. Put in the microwave and heat for one minute at a time, stirring well after each minute. Continue to heat until thick. Allow to come to room temperature. Make sure it is completely cool. Stir well. Add the softened butter, until smooth and combined. Cool a little till perfect spreading consistency. Decorate your cake as you please. I spread melted chocolate onto parchment paper. . very thinly, put it in the fridge for a day or two, and then rolled it up and allowed the chocolate to fall into a zip loc bag to create chocolate shavings, big and small. This recipe was shared with me when I was just a newly wed. Over the years I've made minor changes, but all in all, it's a basic lasagna recipe that always goes over well. Brown meat in large frying pan, drain, add seasoning, tomatoes (while cooking, chop tomatoes into smaller pieces with spatula)) and tomato paste according to taste. Mix cottage or ricotta cheese with egg, Parmesan, parsley, salt and pepper. For two people: Make 2 smaller casseroles, freeze one (before baking) and you’ll still have left overs to enjoy each time. I got this recipe from a 2002 Robin Hood Baking Festival booklet. These are one of my favorite muffins and really it’s hard to believe that something so good is also healthy! If you’re extra health conscious, you can substitute half of the flour for whole wheat, use a little less sugar, and non-fat yogurt. If I don’t have figs, I use chopped dates. Combine egg, yogurt and butter in small bowl. Add to flour mixture, stirring until just moistened. Stir in apples and figs. Spoon batter into greased muffin tins, quite full. Combine topping ingredients and spoon over muffins, pressing in a bit. Extra large muffin tins work well. Bake at 375 F for about 25 minutes, depending on size. We love smoked salmon pizza. 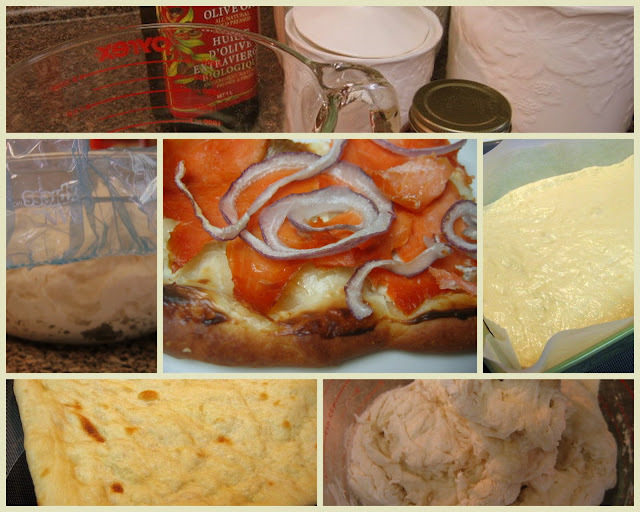 The dough has olive oil base and it sits in the fridge until you are ready to use it. Mix together the yeast, sugar, salt and olive oil with the water in a large bowl. Mix in the flour with a wooden spoon and stir well. Put in the fridge for a few days or leave on the counter for a few hours and use right away. Take half the dough and spread it on a large cookie sheet that had a smidge of olive oil on it and let it rest a few hours. Bake the dough at 400 on the parchment paper and cookie sheet until firm, about 10 minutes. Spread, half a brick (4 ounces) of cream cheese. Top with very thinly sliced smoked salmon. (I buy mine at Costco). Sprinkle on very thin red onion and finely chopped fresh dill weed. Put back into the hot oven or on a grill without the cookie sheet. Just a crisp salad is all that is needed to make a nice dinner. We have a wonderful Chinese food restaurant in our town where one of my favorite menu items is their lettuce wrap. When I found a recipe that looked similar, I decided to give it a try. I will be making this dish again and again! Core head of lettuce. Hold upside down under cold, running water...gently pull the leaves away from the core, one at a time. Each leaf will from a natural cup. Remove excess water from leaves...and chill in refrigerator until needed. Brown ground beef in heavy skillet. Add ginger, garlic, peppers, carrot and onion. Fry until veggies are tender. Add the steam fried noodles and cook for 2-3 minutes longer (noodles should still be crunchy). Transfer mixture to serving platter. Place platter on table, alongside a plate of lettuce leaves and bowl of hoisin sauce. 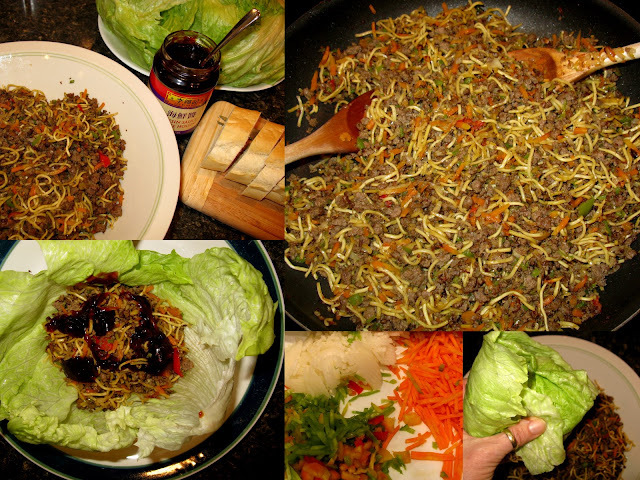 To serve, allow each person to spoon a portion of the meat into a lettuce leaf...top with hoisin sauce. Wrap the lettuce around the meat like a burrito, and enjoy! Cooks notes: The hoisin sauce can be found in the Asian section of the grocery store. It's what gives the flavour, so it is not optional! This sweet bun is pronounced ploosh-tche in Low German or ploosh-ke in High German, which is the German I grew up with. My mom-in-law speaks the Low German to me and I answer in the High German. That’s how we have communicated for over 30 years and although we hardly notice it, it would sound funny to someone listening. 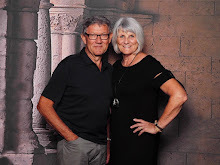 Since she was born in Russia, experienced the same hardships as my grandparents did and is 40 years older than I am, she has often been more of on Oma image to me. She loves calling and seeing what I’m doing. When she found out I was making Plushke, she was in heaven! She asked me if I was having “yast” (guests). Obviously she would have made these for guests. I didn’t even try to explain why I was really making them. So, here’s to all of our blogland “yast’, a recipe that, when I bit into them reminded me of being a child and dipping by bun in sugar. This is my Mom’s recipe. Scald milk and butter and salt. Cool slightly with a few ice cubes if using instant (fast acting) yeast, or to ‘warm’ if using traditional yeast. (If using traditional yeast, mix with a 2 Tbsp sugar, then ½ cup warm water to dissolve – let stand 10 min) I’ve found that instant yeast (which you just add to the flour) is more forgiving when it comes to hot liquids, whereas regular/traditional yeast can be killed if the liquids are too hot. Beat eggs and sugar well in large mixing bowl or dough machine bowl. Slowly stir in milk and butter, then regular yeast mixture or instant yeast mixed with 1 cup flour, continue adding flour, one cup at a time. Using a dough hook makes this easy. Knead until dough is smooth and holds together nicely. Transfer to larger bowl and cover loosely with tea towel and plastic. Now, my mom used to cut little squares and do a crossover thing with little cuts so that it looked like a flower, but you can do whatever you want. What I did: Divide the dough into 4 parts. Pat each part into a circle on floured surface and use a rolling pin to roll out a bit larger than a dinner plate. Spread each circle with 1 tablespoon melted butter and sprinkle with 3 tablespoons sugar. Cut into 12 wedges. Roll wedges up starting from the outside. Place on parchment lined cookie sheet. Cover and let rise 1 hour. Bake at 350 F for about 15 minutes. Oma would have thinly covered the whole bun. I like to play with icing, so I did a drizzly spread. This is comfort food at it's best for me. This meal was one of my favorites that my Mom made. I've added a few more ingredients than she did, but the basic recipe is the one from my her kitchen. 1 large onion sliced into rings, to add to pan once you start browning the meat. Mix above ingredients (except the large onions slices) together and form into 4 patties. Stir coating mix together on a large dinner plate. Dredge each pattie on both sides. Place 3 tablespoons cooking oil in a heavy pan or electric fry pan. Once it begins to get hot place the coated patties into the pan. It's best to keep temperature at medium. Add the slices of onion rings to the pan to sauce along with the meat. Add a little more oil if you need. Once meat is well browned on first side flip and brown on the other side. You want a nice crust on both sides. Once you have flipped the patties take the sauteed onions and place on to of the patties so they don't get too dark and dry out. Once meat is cooked through, (approximately 7 minutes per side) remove to platter and keep warm in a low temperature oven. Using the same pan you fried meat in heat oil and add mushrooms. Stir over medium heat until they begin to brown. Add remaining ingredients and stir, scraping in all the bits left from the meat and onions. If mixture looks too thick add a little milk. Simmer for 5 minutes. Add the meat and the onions to the gravy and simmer another 5 minutes. Spoon the gravy over meat in the pan. Do not flip meat as it's very tender and may fall apart. Serve with mashed potatoes and your favorite vegetable. What school child could resist a couple of these in their lunch bag? Make up a batch and pop them into a freezer bag and - good bye lunch making blues. Right now I'm making them for a birthday open house. I know from experience that they will be the first to go on the buffet. 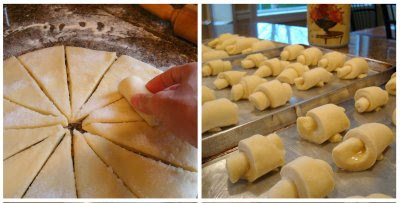 The Refrigerator Rolls dough is also great for crescent or cloverleaf rolls. Mix it before you go to bed and bake them fresh in the morning. and an old Pillsbury cookbook. Before taking dough out of the refrigerator in the morning, prepare ham and cheese. I ask the deli for old fashioned ham sliced slightly thicker than usual. I cut the ham into 1 1/2 - 2 inch squares . I also use old cheddar cheese sliced and cut into 1/2 - 1 inch squares. 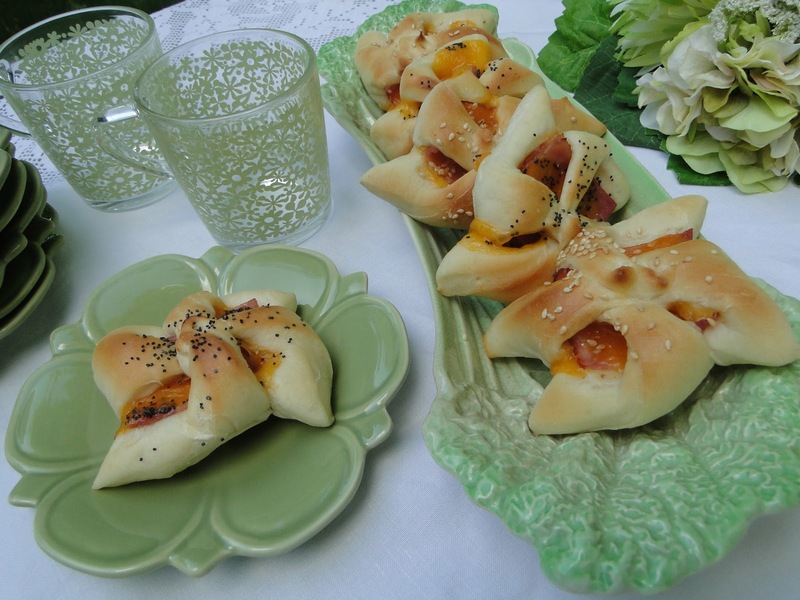 You will need one square of sliced ham and 2 squares of cheese for each pinwheel. Divide dough into 4 equal portions and roll each portion into a square about 12-14 inches. Using a pizza cutter, cut dough into 12 3 inch squares. From the corner of each square, make a 1 inch diagonal cut towards the centre. Do not cut right through the centre. See photos below. Place a square of cheddar cheese in the centre uncut portion of each square. Top each with a square of ham and then top the ham with another square of cheese. Pull the left point of each triangular cut section toward the middle forming a pinwheeel (like those the children carry in the wind). The trick is to use the same corner on each side of the square. Secure the points in the centre with a toothpick. Place on parchment covered baking sheets and let rise in a warm place until double in bulk. Just before baking, brush each pinwheel with milk and sprinkle with either sesame seed or poppy seed. Bake in preheated oven at 375 degrees for 10 minutes or until nicely browned. Remove to racks, take the toothpicks out and let cool. Some of the cheese will have oozed out and you can remove the cheese "puddles" before serving if you like. Nadia’s Blintzes, this recipe is from my extended families cookbook. Beat the eggs in large bowl of mixer. Slowly add the milk to the eggs while continuing beating. Add salt, sugar and oil, beat until blended. Slowly beat in the flour until combined. Using one or two 10″ heavy Teflon pans to cook the blintzes. Coat the pan lightly with oil. (I use a piece of cheesecloth to coat the pan with oil and if needed I’ll coat again into the cooking process). Heat the pan to medium high heat. Use a 1/3 cup measure to dip into the mixing bowl (you don’t have to fill to the top just use a uniform measure of the liquid for each blintz) and pour into frying pan and swirl the pan to coat the bottom evenly. Cook until the blintz turns a nice golden brown. With a spatula loosen the edges and flip the blintz to brown the other side. Remove from pan and let cool on a dish cloth. Repeat the process till all the egg mixture is used up. Sometimes the only hindrance to these flipping and cooking well is the temperature of the pan. You’ll have to experiment to get it at the right temperature. Start at medium. After the blintzes are cooled you can stack them. They can be frozen at this time if you would like. This recipe will make approximately 24 blintzes. Beat all the ingredients till smooth except the half and half and stick of butter. Spread about 1 Tablespoon of cheese onto one side of blintz. Roll up and place in a 9×13 baking dish. You can fill the dish with two layers. Melt one cube of butter and pour over the blintzes. Bake in 350 degree oven until heated through. Heat up to 8 ounces of Half and Half until warm but not boiling. Pour half and half evenly over blintzes and continue baking until half and half boils. Remove from oven and serve with sour cream and preserves or syrup. Saute onion in oil and season with salt and pepper. Add salt and pepper to taste, set aside. Steam broccoli until it just turns bright green. Combine meat, broccoli, cream of mushroom soup and heat through. Scoop about 2-3 T of mixture onto blintz and fold in the sides to form a square. Melt butter and poor over the filled blintzes, evenly. Bake in a 350 to 375 degree oven until heated through. This is by far the best meatloaf I have ever had because it had this wonderful glaze on it that keeps it moist. Even if your family has not liked meatloaf in the past, I’d say you should try this one. I got this recipe at least 25 years ago from my friend Debbie, the mom of one of my son’s best friends growing up. When I asked her recently about posting it, she was quick to let me know that it’s her mom-in-law’s recipe. So, thank you, Mrs. Martens! I know I’ve tweaked the glaze somewhat for some reason a long time ago, but if you read this, Debbie, please feel free to add the original ingredient in a comment. I think it was Worcestershire sauce. Prepare a 9 x 13 inch pan by lining it with foil or parchment paper. Mix all ingredients well and shape into loaf. Place on baking pan and make an indentation along the top of the loaf. Cover meatloaf completely with topping. Bake at 350 F about 60 – 75 min., depending on shape. For two people: mix whole recipe using fresh hamburger, shape and divide to make 2 mini loaves. Freeze one and cover with topping just before baking. This really isn't a recipe - just a fast and easy way to make great tasting potatoes. This is a good way to do potatoes on the BBQ as well. Lay out one piece of foil for each potato. Cut each potato into 1/2 inch slices or 1 inch cubes. Sprinkle with diced onion and salt and pepper and dot with about 1teaspoon or so of butter. Wrap each package up tightly - use a double fold so the butter doesn't leak out while it's baking. Bake at 350 degrees for 30-40 minutes or until potato is done. Serve in foil or empty packages into serving bowl. You can pass the sour cream if desired. The soup was simmering and there was still time to make a batch of fresh scones for dinner. What could be better on a cold winter's day than some light and flaky scones straight from the oven? Actually, it was more about trying out my new cast iron skillet, than about baking scones, but they made a great team (the skillet and the scones) and I'll be doing that again soon! Savory scones need herbs, and fresh is always best, but things weren't looking too good in my herb garden. I pulled back the blanket of snow far enough to find a few chives that I could use, but supplemented that with dill weed. Combine flour, baking powder and salt...cut in butter to form pea-sized pieces. Add grated cheddar and herbs (of your choice). Mix eggs and buttermilk and quickly add them to the flour mixture. Dump the dough onto a well-floured surface and knead a few times. Pat into a circle about 1 inch thick...in my case, to fit my 12" cast iron skillet. 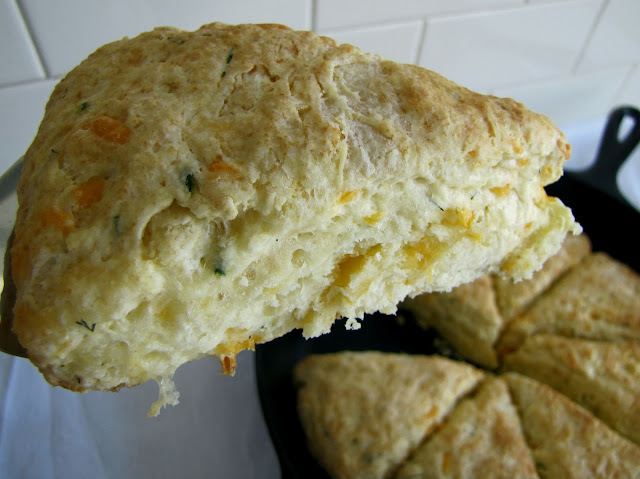 Cut into 8 wedges and place on a parchment lined baking sheet or in a cast iron skillet. Pop into the pre-heated oven and bake for 20-25 minutes. The key to light and fluffy scones is to handle the dough as little as possible. I used buttermilk, but you can substitute whole milk with a teaspoon of lemon juice. These are quick and easy and so fun to serve from a cast iron skillet! Pop the extra scones into the freezer and re-heat to serve 'fresh' scones tomorrow (or the tomorrow after that). I thought that after Judy's post about Yerba Mate, I would post a common snack that is served along with the Paraguay Tea. These are little hard crunchy balls of bread dough, either made into bread sticks or little balls. Paraguay is a very hot country and these were baked to preserve the bread longer when no way better way of storing the bread that was available, years ago. They are very time consuming and they get eaten up like popcorn, so I very rarely make them. Combine all ingredients together and knead the dough together well...adding enough flour to make a firm dough. Let rise about 1/2 hour. Take little pieces of dough and roll into a pencil strip. Cut into pieces, according to desired length. Bake @ 300, for 40 minutes. After all the pans have been baked. Put them all into a roaster and back into the oven and bake again for another 30 minutes shaking them in between to have an even bake. It may take a little longer if the balls are larger ones and soft. The end result should be very hard and crunchy balls.